Antique silver-plated forks shape-shift into rare miniature owls with a little help from Doug Heifetz. Forks: They're not just for dinner. Some of them wriggle free from the silverware drawer and shape-shift into the creature they were destined to be. In this case: a rare miniature owl. Doug Heifetz is the creative mind behind these unique sculptural pieces. 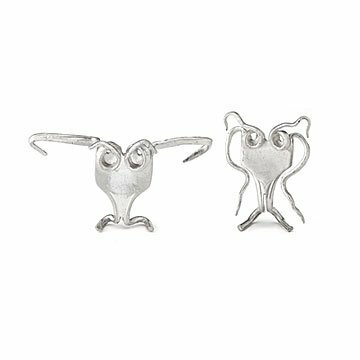 He fuses together vintage silver-plated forks, transforming their handles into bodies and tines into eyes, wings, and legs. Keep the set on your desk to brighten your day or hoo knows, maybe it's just right for your animal-loving friend. Handmade in Maryland.